Hi Gorgeous Gang! I’m back with something new to show you today. We finally moved two weeks ago and I’m really enjoying my new craft room, it’s awesome to be able to have my own space with everything I need within reach. I love just sitting here, looking around and feeling inspired by all of my craft goodies…lol. So for todays post I decided to create something using one of my favorite color combo’s, copper and teal (with a hint of bronze and black). It’s an easy tag to create so I would love for you to join me, go grab your copper and teal Lindy’s sprays and powders. The first step is to cut out a piece of cardboard together with a piece of design paper of your choice and adhere the two together using ModPodge. 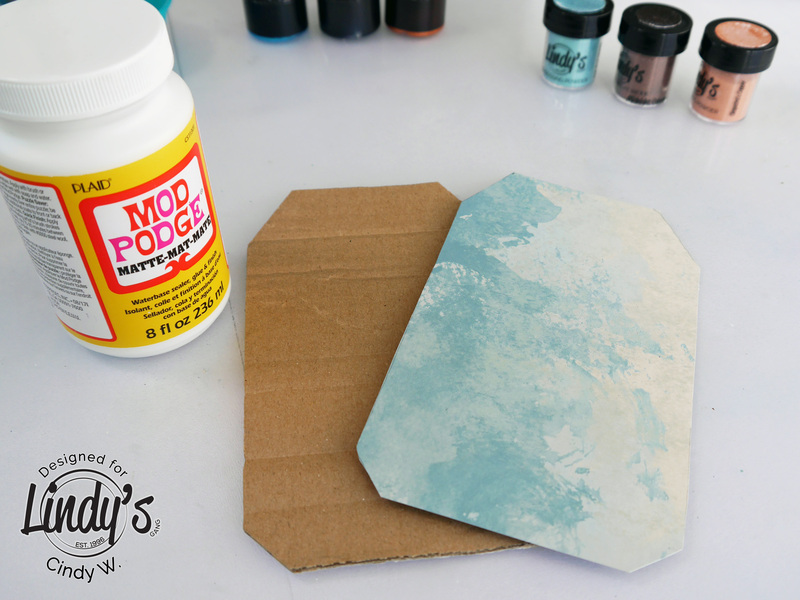 Don’t forget to add an extra layer of ModPodge on top of design paper to make sure it won’t wrinkle and stays in place. I love using Tissue Paper, especially the printed ones. This one is just perfect for the vintage kind of feeling and the moths match the stamp I’m planning to use, so just perfect. I also adhered this with ModPodge. 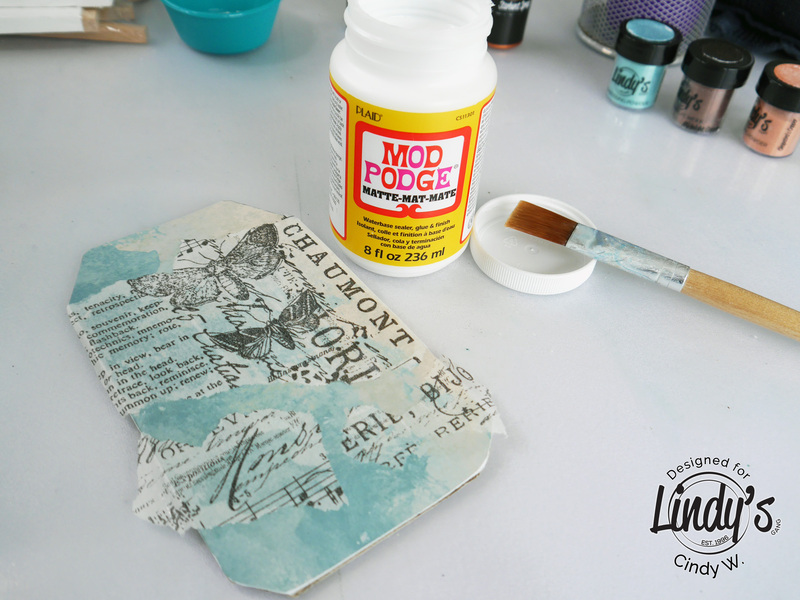 If you like to add some color using ink sprays or magical powder you need to add a layer of clear gesso after the ModPodge. I’m not adding any color to my tag so I only used ModPodge. I love working with black modeling paste and Lindy’s embossing powders, so I used a stencil and some black paste to add a bit of texture. I’ve sprinkled two different colors of embossing powder on top of the paste before it dried. I used Midnight Copper and Desert Moon Turquoise for this – a beautiful combination. I adhered some pieces of drywall tape and thin string to the tag and stamped a butterfly on to parchment paper. I embossed it with Midnight Copper Embossing powder. I collected a couple of paper roses, in white and black and added color to them using Glitz Spritz, Flat Fabio and Starburst Sprays. I then used two dies to cut out these cute little branches and embossed them with two layers of powder using VersaMark and Cleopatra’s Copper and Midnight copper. Then I colored three pieces of seam binding, two in teal and one in copper and let them dry for a bit. I absolutely love seam binding and it’s great to use it with sprays to make sure all colors coordinate. I used my Crop-A-Dile to punch a whole and add an eyelet to my tag. I adhered everything using soft gel medium and glue. Then I added the seam binding and tied in some extra knots. I really like the way the colors turned out and especially the teal seam binding is stunning! Beautiful tag,I loved the color combo !